Well, it had to happen sooner or later. As the father of a teen I am facing one of those dreaded choices one has to make with and on behalf of a teen son, in this case; the choice of a (high)school. I have had some sleepless nights over this. What road to follow and how will that affect my son's future? And there are a number of factors in play here; what is it he wants? What is it that I want? Will he have a future in the direction he chooses? Etc. etc. The direction he has chosen, digital design, is something he really is into, so he is highly motivated. It is, however, a field or subject I have no affiliation or interest with or in.... at all. It couldn't be farther from what I advocate and stand for, but it is his choice. Should I, as a father, step in here and point out the potential pitfalls, the way I see it, such as bleak future prospects both in career and practical usability or maybe even downright interfere? The answer to that would, based on my own experience on the receiving end, be a simple NO. That would kill any and all motivation and I know what the disastrous result of that would be. So I stepped aside and let him make a choice, after laying out the option before him. And he chose to go ahead. Which is good, since he stands fast with what he wants and believes in, even after having been confronted with other options or possible outcomes. And he has chosen a school that turns out to be quite different than the others too. No regular, communal, government controlled school, but as it turned out, a privately owned school with their own principles and guidelines. Principles and guidelines we, as a family, all approve of. He will not be drilled into a brick-in-the-wall kind of position, limited by guidelines and expectations. He ends up on a school that challenges each individual, gives him a lot of opportunities to try out fields of expertise and guarantees the maximum amount of interaction with and guidance by teachers. Quite a young staff they have too. We attended a few open house events, talked to the staff and the principal, who happens to be from the Netherlands too, and the vibe we got was that this is a school that emphasises on equality, for as far as that is possible, cooperation and stimulation of developing the individual's capabilities. I was quite impressed with the very broad spectrum of classes and subjects that is offered to the kids, even within certain fields of choice. It somehow feels like a modern, high-tech kind of artschool. If anything, this school has quite a bit of that same feeling about it as the Steiner/Waldorf school had that our kids went to back in the Netherlands, only much more modern and more grown up. That same sort of creative flow and this is my son's kind of creativity. And our son is really eager to go there and that is the most important thing of all. And all I can hope is that he will find, what he is looking for. That it'll bring him, what he aims for.....Knowing his life will take him in other directions, when he is ready for that, too. It was good, because I got to meet new people, I got to experience a new craft, it challenged my way of creative thinking and I ended up with a nice bonus too. The course itself was pretty straight forward; a full saturday and sunday 09:00-17:00, including coffeebreaks and lunch. Turned out our lady blacksmith Carina is someone who likes to socialise, but also makes the most use of hours available. So no excessively long breaks. The information and background theory were quite rudimentary, but then again we were there to bang on some hot iron, not become theoretically educated in the art and craft of blacksmithing and metalworking! We started of with a standard items, which we'd all make together, using the information we had just gotten; a crook or wallhanger with a leafshape on top and a curled hook at the bottom and some nails to go with those. This way we would understand the use and importance of the metal temperature, how to flatten and curl it and how to basically work metal. After this and a break we were pretty much given free hand at crafting whatever we wishes. 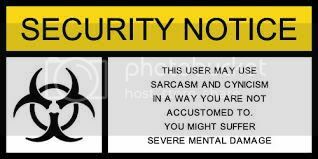 Within acceptable and reasonable boundaries of course. Of course I wanted to make my very own firesteel. The ones we had made are nice, of course, but made by someone else; our local blacksmith. And they didn't throw sparks very well either. Carina and I tried rehardening them, but to no avail. So either there is too little carbon in the steel ( a modern file) or the contact surface is to broad, so you cabä't scrape off good glowing flakes. The one I made is a lot smaller, narrower and lighter and made from an old file..... And it throws sparks, baby! So I am quite pleased with that. I ended up cheating. I couldn't get the 3 pieces to be the same, couldn't get the areas where they'd meet flattened and lined up properly, so riveting them together was not possible. I asked her to just spot weld them together and I camouflaged the weld with wire. Looks quite good actually.... and the stand is level too!! Just a tad higher than I had initially planned, but still I am quite pleased. One of them is a tray (24) of eggs. Freshly laid eggs from free ranging chickens, directly from the coop, including poop and feathers. For a very, very good price! And they are good! What taste!! The other bonus is a sandstone sharpeningstone. One like I already have, but round, not eggshaped. I spotted it sitting underneath one of the storagebuildings, while I was taking a breath of air ( and cool down) and I made a remark to Carina that that was some fine, oldfashioned piece of equipment. She looked at me and said:" You want it? Take it. It's been lying there for 15 years. I don't use it....." So that one followed me home. Now I can fix my sharpening arrangement and finally start sharpening my scythes! I will also end up with a few plant supports. 5 to be exact and for a very fair price too, considering the material costs, time I would have to spend and tools I'd have to borrow. All in all I am glad I went along, even if I will never be a smith. Metalworking simply is not for me. ... and wind.... and occasionally a little sunshine! Damn, I wish spring would move up faster! It's been rainy and cold this past week. Temperatures barely reaching 10C. Windy too, but we had a few sunny days as well. 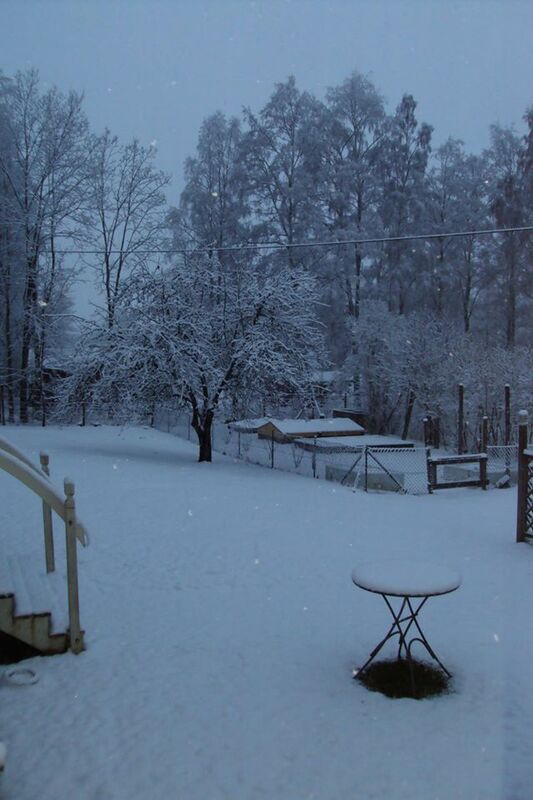 I keep forgetting that april here really is an early spring month and that spring usually doesn't really kick in until may. My seasonal clock is still tuned for Dutch seasons, even after 5 years. 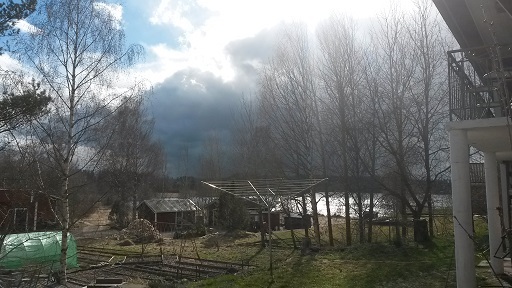 However..... Like I said, we do have occasional bursts of sunshine and being busy in the greenhouse is kind of nice, when the rain patters on the roof overhead. 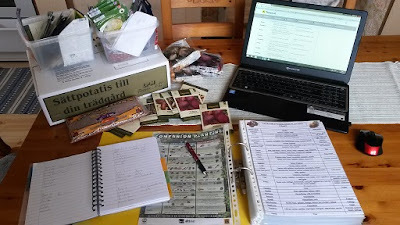 I am sowing and planting and reading and planning... full steam ahead! The funny thing about these showers is that, before they reach you, they are preceded by a wave of cold air rushing toward you. A dark cloud at the horizon shows up and when a sudden and cold wind reaches you, you know the rain/sleet/snow/hail or mixed shower is heading your way. I guess the icy cold of that showers creates a downdraft before it, sucking in the warmer air from the top and pushing out cold air at the bottom. I also noticed that by the intensity of those gusts you can predict to a certain degree how heavy the coming shower will be. The more wind, the more heavenly water will be poured down on you. Now you might wonder why the heck I didn't do that during winter. Well, I did. But as it happens quite a few more seeds and information ended up here and that made some changes necessary. Quite a few actually. At the very last we decided to have potatoes. So we needed to "design" a potato-patch. And we needed some accompanying plants for the potatoes. And potatoes do not mix well with others, so these had to be redesignated to other parts of the garden..... which had to be redesigned too. And so forth. 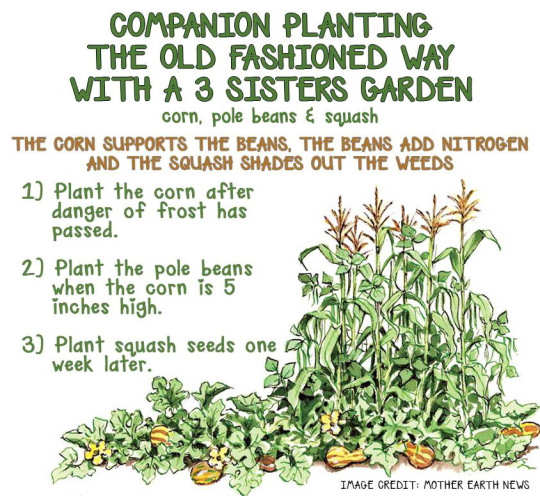 And I found this very cool thing on Mother Earth news, called "the three sisters", when googling for companion planting..... Apparently an old native American (or Indian) thing, meaning a combination of corn, pumpkins and beans. 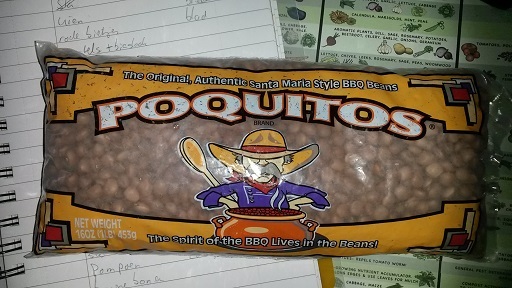 Now American beans are not the same as European or Dutch ones. For us beans usually mean those long, fresh, green ones. So again some redesigning was to be done...... And as icing on the cake there was that small package I received from California, from my dear internetfriend Renée (Tresjolie, who runs 2 blogs; grindstone ranch weekly and the view from grindstone ranch She intended them to become some form of dinner and I saw them as something to grow, before they become some form of dinner... The poquito beans! I dare say they are quite unique for Sweden!! There's a huge learningcurve ahead of us here. And speaking of learningcurves.... There are more. Some in the order of books (of course) and one in the form of a course. 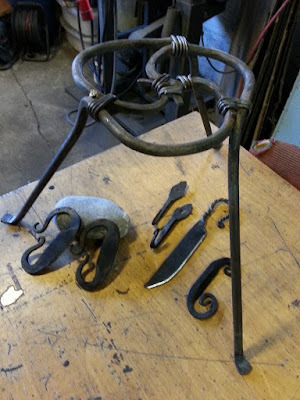 I am going on a 2-day blacksmithing course coming weekend. The other books are Phil Chandler's books on top bar hives; Balanced beekeeping I&II. 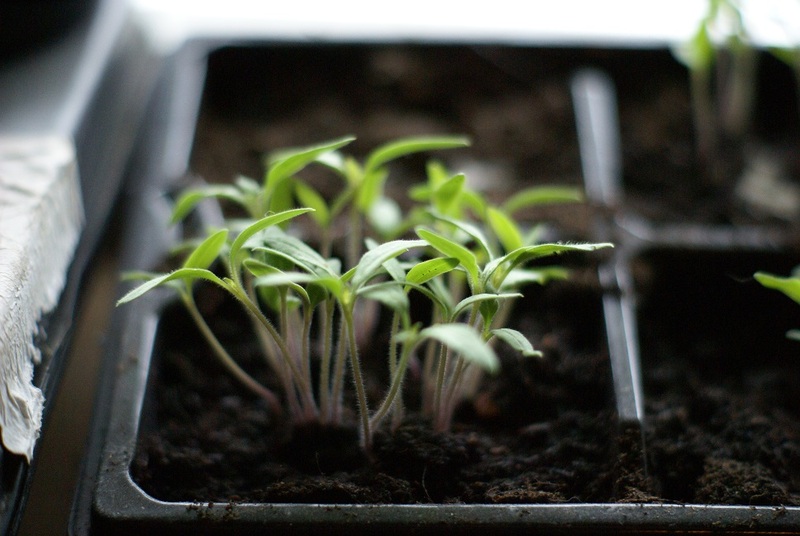 The first one is all about building them, the second one is about how to use and maintain them, so that the ladies inside thrive. Massive protests have occurred all across France and spreading into Europe! Those protests initially seemed to be peaceful, but I assure you that that will not last long. I am predicting violence erupting everywhere and the authorities will act accordingly; curfews, arrests, policeviolence.... Anything to suppress this spontaneous outbreak of civil anger and disobedience. "There’s something here that I’ve never seen before in France – all these people converge here each night of their own accord to talk and debate ideas – from housing to the universal wages, refugees, any topic they like. No one has told them to, no unions are pushing them on – they’re coming of their own accord." Does it all start again in France? Will there be another "storming the Bastille"- kind event? Will there be another revolution? Given the interconnectedness these days it most likely will spread and spread fast! The ruling class has become to arrogant, to brutal, to reckless and to deranged. Thus, today on the Place de la République, it is not 9 April; it is 40 March. Playing with dates deliberately echoes the French Revolution, which started in “year one”. It involuntarily recalls the opening line of George Orwell’s 1984, when a clock strikes 13. In the early days, the participants had no individual names. Everyone was “Camille”, a name which can be male or female in French. But it is difficult to enforce rules in a movement with no rules – and individual names are creeping back. Of course the mainstream media is depicting these demonstrations as "violent" and they'll do just about anything to label this movement as "leftist", "anarchistic" or whatever "undesirable" label they can come up with. And the Swedish media?? Silent as a churchyard!!! I realised that the piece about the dogs was a result of my frustration and irritation. I also realised that that's not so much the dog's fault as much as it is mine. They just are who they are; high energy dogs with their own characters and shortcomings and I am the one who is not all that high energy with my own character and shortcomings. As much as I would like the dogs to adapt to me, they can only comply up to a certain point, so it is up to me to adapt to them too. And here's where the problem lies; I do not know if I can. The physical fitness thing; sure, with a lot of exercising I would get into shape, but I also like to take it slow. And then there's the patience thing.... plus the finances of course. Doing dogtraining, getting equipment. At this point I am really not sure if I can or want to commit myself that much. On the other hand I also realised where Lester comes from today. As we walked along the shore of the lake, there was a galy wind and it blew the water in waves onto the rocks, making them splash quite loud. Lester was running and jumping up and down the shore, not sure what to make of it. And I realised that this was likely the first time he had ever seen this! Almost 2 years old!! No wonder he's been acting like a deranged rabbit, stuck with his nose to the ground. The disappearing snow revealed all sorts of things he has never seen or smelled before!! He came to us from the centre of a larger city out into the countryside, when winter was upon us. Rex on the other hand is developing a kind of behaviour I am not at all happy about. We met one of the neighbours and his male dog, about the same age as Rex, and Rex charged at him. I could barely hold him back! He was very aggressive and he really went at him. If I had not had had him on a strong leash and would have backed up a few meters, he would have had attacked the other dog. He has also become increasingly disobedient. It feels like we have to raise him all over again. I seriously underestimated the consequences of having these dogs. I really did. And I must admit that I am pondering over the issue of relocating them. Not because they fail me, but because I am failing them. Having them makes me doubt if I would ever be the kind of person that would or could handle animals properly. Animals you work with and that require high maintenance, training or constant care. Animals like horses for instance. And dogs. 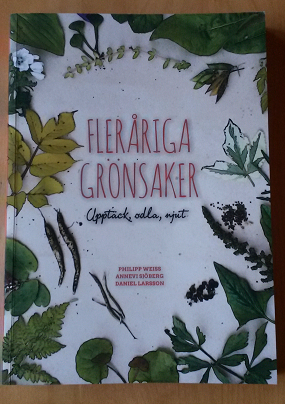 I probably really am a plantperson above anything else, I guess. Good thing the right season is upon us. 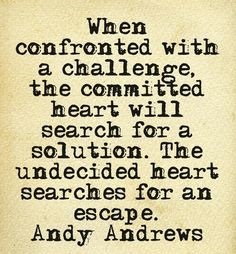 On the other hand if I could overcome this obstacle, these issues I might find myself in a much better situation. How to do this, is the big question. I know the main issue lies with me. The solution too.... somewhere.... Maybe they are here to show me something in the mirror? I gave it a bit of a try this afternoon, despite physical limitations, and tried running a bit with the dogs. That went fairly well and once the dogs got the hang of it, they took off! I had to yell to get them to stop almost immediately! I just couldn't keep up! So the will to run and work most certainly is there, but there were complications too. As long as Rex ran next to Lester, he would snap at him and get into a brawl. When I held back Lester, Rex would stop, turn and do the same until I told him off real good. As long as Lester is behind Rex and out of sight then they run in unison.... and fast!! Tried it a little while later again and with the same results. So there is at least one lesson learned. Two actually... their endurance is as bad as mine at this moment. Well, it looks as if those are pretty much numbered. Spring is here, folks! And it came with clear blue skies, sunshine and quite pleasant temperatures. And the first calls of a loon!!! Everyday more and new summer residents arrive; Swans are numerous this year and our lakes are inhabited by gulls again. We see very large flights of them everywhere! Terns too. And today I spotted 2 sädesärla or white wagtails (motacilla alba). There can not be any better sign for spring's arrival! 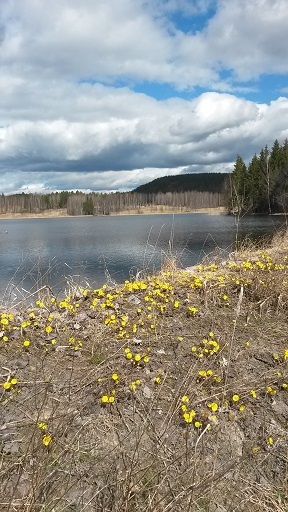 Spring has come,so we got busy once more! 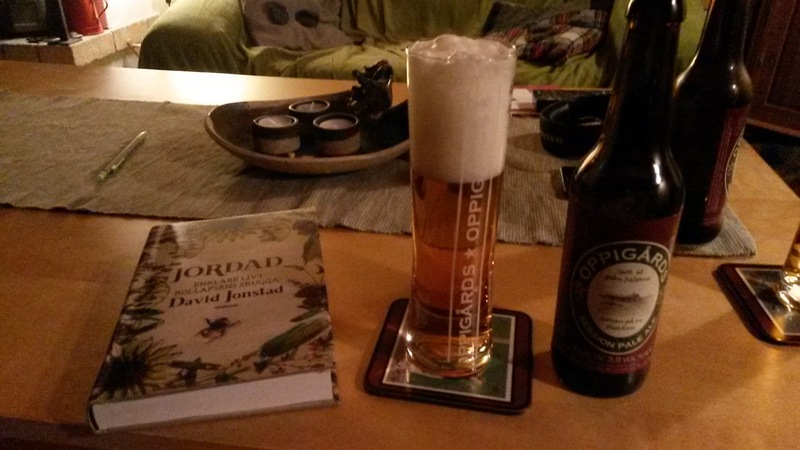 But before that we have been enjoying its arrival. 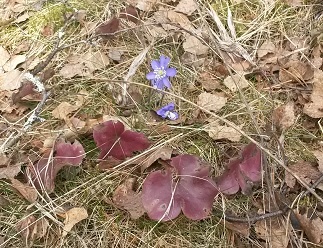 The first frail flowers are showing the true colors. All of the ice and snow is gone, but the lakes were still covered in ice. Which looked like a layer of wet tissues or toilet paper floating on the surface; a weird kind of mush, but still strong enough to carry the seagulls that have been returning as I saw yesterday morning, when walking the dogs. It is quite busy on the lakes these days. many a bird is trying to establish its own territory and the neighbours are not always friendly. 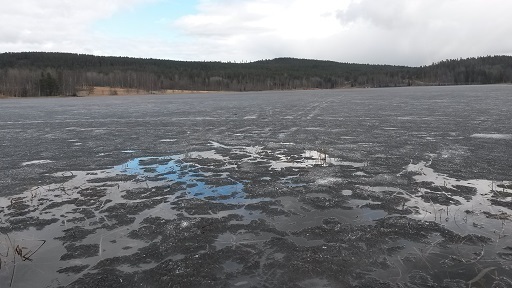 When I passed the same lake early in the evening, more than half the lake was icefree! And today only the shady places remain covered by ice. The rest is open water. Ahhh what the change in atmosphere and color that produced. 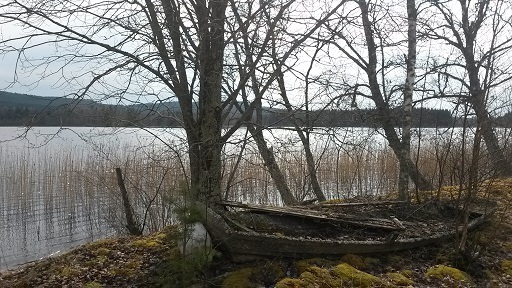 The land lake looked a lot friendlier, the colors warmer, not as bleak anymore. It lifts ones spirit immediately. The fine weather meant a surge in activities around the house too. I made a start with refilling firewood for next winter, sorted out a large pile of planking in 2 categories; useful for building and furnacefood a.k.a. firewood. Much of it is riddled with nails, screws and the occasional dab of paint, so that will keep us warm on colder days. 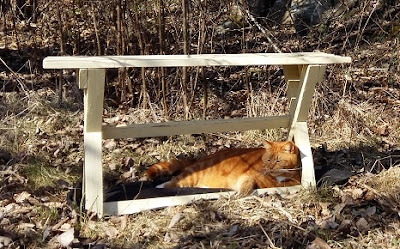 And of course a garden can't be a real garden without a gardenbench. We "saved" the old bench we found here, when we moved in. 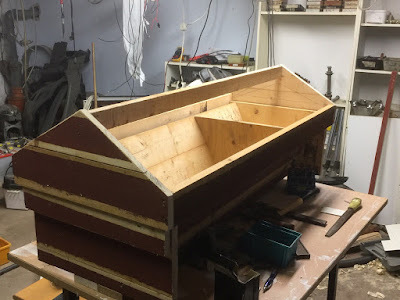 I was about to redesignate it as "furnacefood", but my wife thought it would make a neat bench to relax on during hard work. And right she is.... Our red cat thought so too! Even though it feels good to be a bit stiff and sore again after the first day of gardening, it is equally enjoyable to just sit there, enjoy some tea and look around or listen.... So much to discover!! 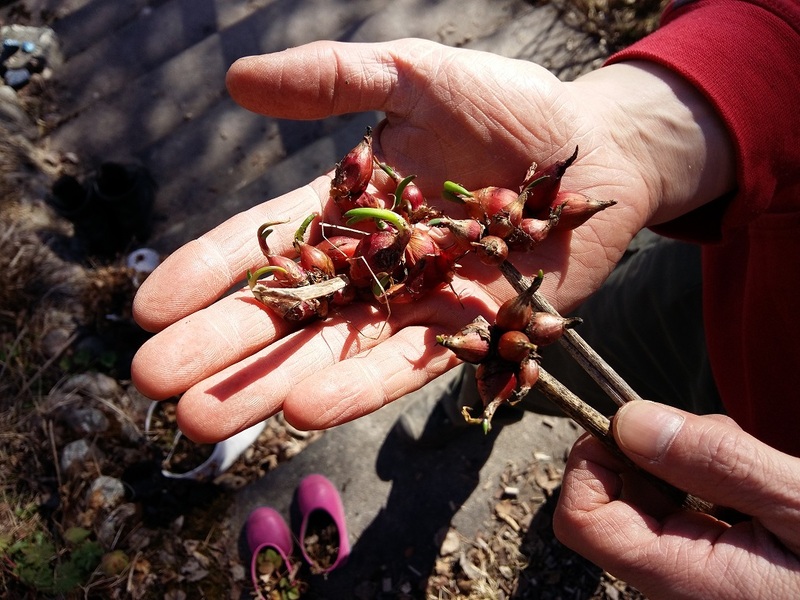 There was also a surprise waiting for us and my wife discovered it among the leaflitter; Egyptisk luftlök or Egyptian walking onion (Allium cepa v. viviparum). It actually walks. It makes small bulbs at the end of long stem and those stems wither. The fall over and the newly created bulbs hit the ground and start growing there, one step away from the motherplant. I got these last year from a neighbour, saying it was garlic... Well, it's not, but great nonetheless! But in the meantime we have put up the greenhouse frame and we have been rethinking our garden layout, mainly because the greenhouse is bigger than we had figured! For now it will sit on the small patch of still unworked land and there we will sow and grow our plants for this year. Because of a lack of planning and time my anticipated pattern of crop rotation got pretty much messed up. I ended up fertilising and covering random plantbeds and that might interfere with the plans..... I will have to make alternative plans and start the rotation in earnest next season. 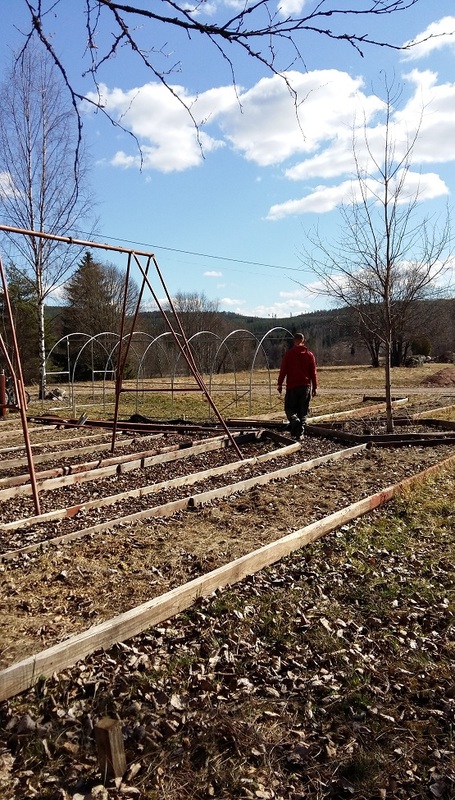 I think I will go for a 4 year cycle and the planned beds that have to be created yet will become beds with edible perennials. I am expecting a book on just that subject by the end of the month... for now I'll enjoy the sunny days while they last and make the most of them! Spring is inching its way up here!! Yes, spring has finally come to the north again. These past few days saw ever increasing numbers of geese arriving. Well, we actually heard them more then we saw them, since they apparently prefer to travel during the night. As I wrote before, cranes and whooper swans already made their way here and more and more summer residents are coming back. The numbers of blackbirds increase daily, the cooing sound of pigeons can be heard in the forest and a group of redwing or rödvingetrast (Turdus iliacus) visited our garden yesterday. 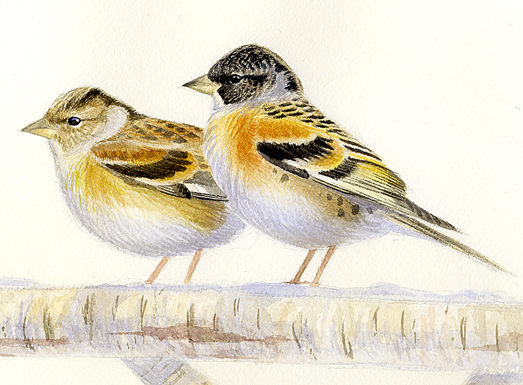 The most notable ones have gathered in a large flock that is very audibly present in the trees in and around our garden right now; Bergfink or bramblings (Fringilla montifringilla). Dozens have gathered here and you can not get around hearing them!! They are fine looking birds too. The now unused horsepasture across the road sees the arrival of a group of starlings and everyone keeps a healthy distance from a pair of crows that patrol the area on foot. They appear massive and huge next to the finches!!! damp for a while now, so it is hard to feel like spring is here. 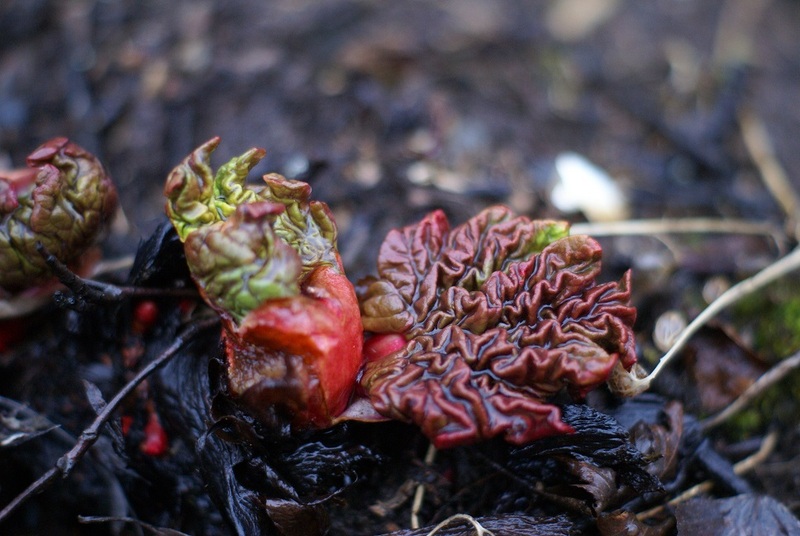 But the rhubarbs are budding, the garlic, which came from England last autumn is also showing its sprouts and the crocus are blooming.... sort of. The sweet scent of sap rising and wet soil fills the air. That same scent, or a variety thereof also fills the house and than it quickly becomes less romantic; wet dogs, muddy paws and damp clothes. The winterboots have been replaced by rubber ones and the wintercoats by raincoats. I miscalculated (mis guessed is more accurate) the amount of firewood we'd need until spring, so now we are burning slightly damp wood. The quality of the wood is not as good as the wood we had during winter either. 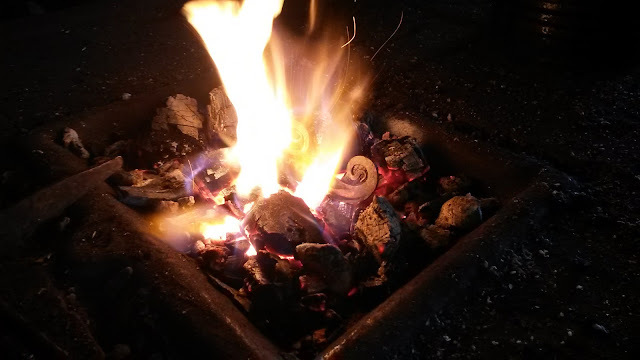 Right now we are burning the cut up potato crates and other woodwaste, which were made out of spruce wood or occasionally holds a splash of paint. They also contain tons of nails and screws, so the ashes will end up in the garbage bin. Slowly the days of idleness will be replaced more and more by days of activity and we these days we are busy building beehives. yes, again. 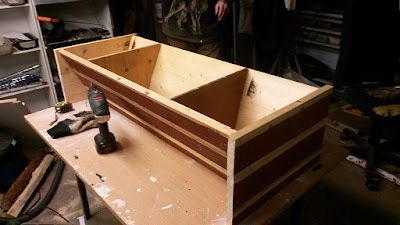 But this time we are building topbar hives. 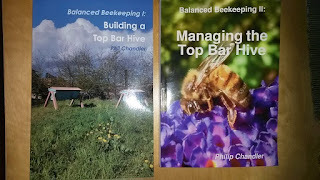 I went and ordered both his books on topbarhives; Balanced beekeeping 1 & 2, Building a topbarhive & managing a topbarhive. So expect a review of these sometime during the summer. 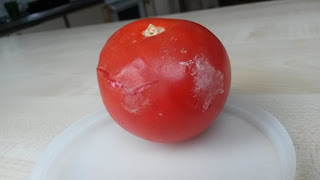 A few tomatoes went bad and mouldy, because they got damaged during transport home. I took one of them, cut a few discs, put them in pots, covered them lightly with soil, punt them on the windowsill and kept them damp. 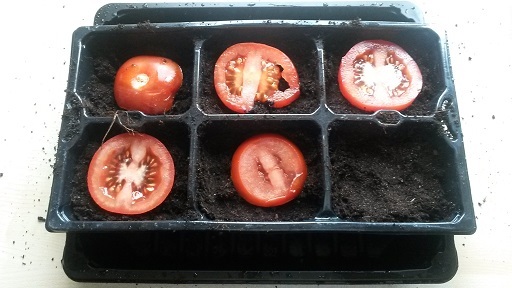 The first thing that grew was the mould!! It formed a pillow right across the surface and no wonder with all that nurturing soil and water. Bad after a few days the first sprouts started showing too! And now there is a cushion of green sprouts growing over the cushion of grey fuzz. 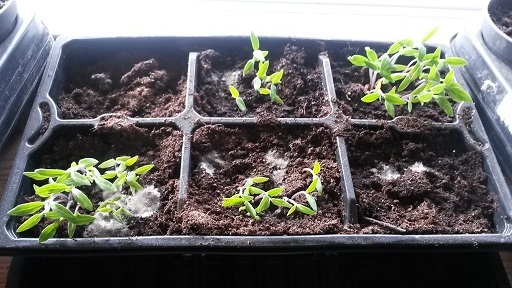 The sprouts do not appear to be affected at all by the mould. Now one thing to remember here; It is very likely that store bought (ecological) tomatoes, like the one I used, are grown from hybrids and as such will not reproduce from seeds! It is equally likely you might end up with tomatoes that are nowhere near as good in taste or form as the one you planted! But it is a fun experiment and ideal to do with kids, since the result is showing quickly with the minimal amount of effort. 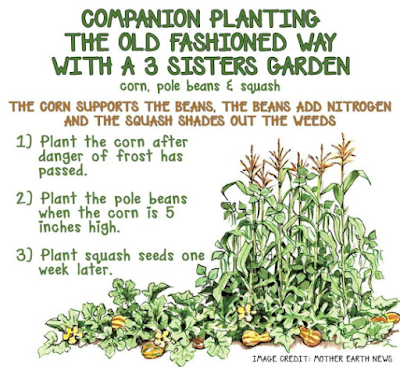 A good way to teach them the basics and to grow plants. Now the muddy paws bring me to another subject that has kept me quite busy so far; Rex and Lester... The honeymoon weeks with Lester are over, so to speak and the grim reality of everyday life has taken over. And at times it is a tad grim. Or maybe more so; demanding. Having 2 dogs is less easy than just having one. For one thing there are the contrasts between the two. rex has always been a heap of bundled, nervous energy, whereas Lester is a very easy going, quiet, leisurely dog. The coming of Lester has increased Rex' jumpiness. It is almost compulsory. This inevitably leads to conflicting situations and a good deal of irritation and frustration for us. When walking the dogs we quite often almost get torn in two. Rex pulling on one end of a leash and Lester refusing to move an inch on the end of the other leash. First Rex sniffs a place and pees on it, then jumps away like a spooked rabbit and is off. But Lester of course has to sniff too and he always takes his sweet time, so rex is janking on the front, because he just wants to go go go and Lester digs in like a stubborn mule, because he ain't done yet..... One 5 meter long leash never touches the ground, the other one drags across the ground in a large curve, weaving from side to side. And when they play Lester shows when he's had enough, but Rex does not get it. He just continues to charge and these charges get fiercer the longer it takes for Lester to engage. And since Lester is physically superior to Rex already, the latter resorts to foul play and he is vicious!! And then there are the issues of Lester's lack of intelligence and Rex' inability or unwillingness to share attention or affection. For starters Lester really is dim. I suspect there is something not quite right with him and I have had that suspicion ever since I discovered the right eye facing outward and the slightly flattened skull/eyesocket at that side. He really is the sweetest and happiest dog, but stupid. Almost 2 years old, but hops around like a 6 months old puppy and sometimes he looks at you with those vacant eyes.... or downright ignores you. And Rex is jealous. Of course he gets a little less attention now. It has to be divided between him and Lester, but we make sure they both get an equal share and Rex regularly a little bit more. Yet still he constantly and actively demands attention and when we meet other dogs he gets even more aggressive towards them then before. I get the feeling he is scared that he will have to share attention with those too and thus feels threatened. It is not that we have the wrong kind of dogs. No, I am thinking that maybe I am not the right caretaker for these dogs after all. As far as I am concerned I will postpone the execution until we have had the possibility to fence in a large part of the garden, so they can be out. Hopefully that will help and if it does we will go and ask for help training them, but above all socialise Rex!